» Conrail Office Car Train 8/22/1997 & Others ! » Port Of Philadelphia PA. * Take a Cruise ! » Conrail Fox Chase Timetable Map 1976. » Railway Express Agency : Ship The Railroad Way ! » America's Fast Trains, Carry Railway Express. » Railway Express -Safe -Swift - Sure ! » Perishable - No Delay ! » GG-1 ELECTRIC, EVERY MILE ELECTRIFIED ! » The Railroad Army, Support Our Troops ! » Support The Magna Carta for Transportation ! » Cross Crossings Cautiously ! 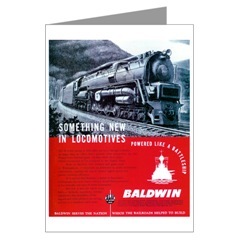 » Ghosts of railroads Past Products ! » DANGER-Dad at Work, ! » DANGER, Mom at Work ! In today’s economy, a picture is worth about about 950 words!! You can search for products with the Dropdown Menu on the Top Left Side of The Page. Tickets Below for All Philadelphia Events ! POLICE GUIDE WEB AWARD SITE ! A Web Directory For Fans of Railroading. We have US Coast Guard, Navy, Army, Air Force, Marines, and veterans items. The Link will take you off site, just use your back button to return. The Broadway Limited ran on the Pennsylvania Railroad from New York to Chicago. It was an all private room Luxury Streamliner. . A deluxe train in its time. The Broadway ran the same basic route mapped out by the old Pennsylnia Railroad, which began the service June 15, 1902, as an all-first-class, all-Pullman train. Inaugurated as the Pennsylvania Special, it became the Broadway Limited in 1912, taking its name not from New York's theater district but from the railroad's wide right-of-way of four and even six track main line or broadway. The last Broadway Limited was run by Amtrak on 9/9/1995. This is an example of a PRR Keystone Type “Drumhead Logo” used on famous trains such as the Pennsylvania Railroad Broadway Limited. The Broadway Limited 1929. Like a Giant Clock that strikes the hour for the countyside.